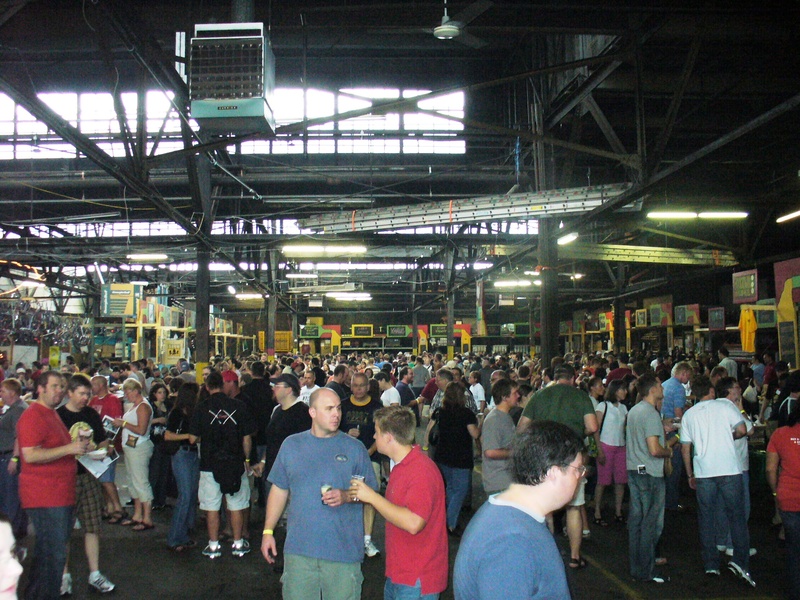 Steel City Big Pour 2008 | Where have the days gone? 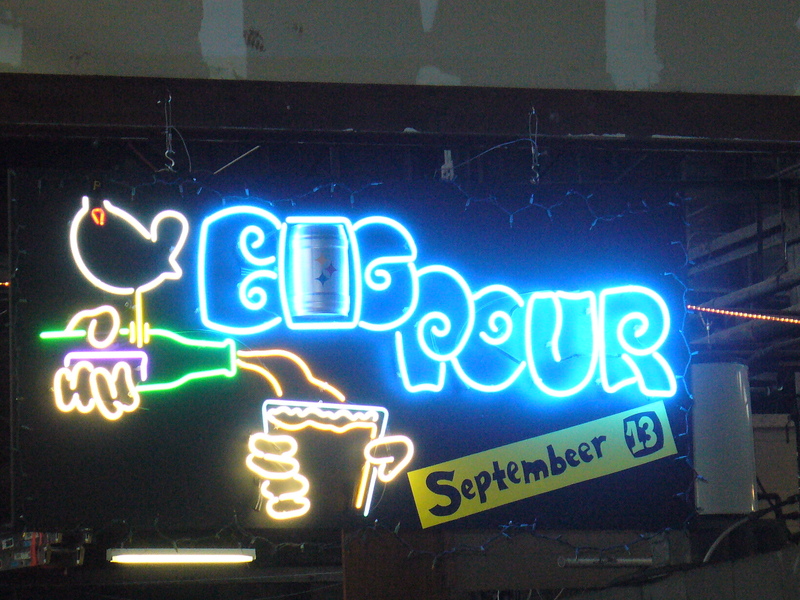 Yesterday was the 2nd annual Steel City Big Pour, "3 hours of beer, live art, and music" to benefit Construction Junction, Pittsburgh's nonprofit building material recycler. This year there were two 3-hour sessions, both of which were sold out at 1,000 tickets each – it was the hot ticket in town yesterday! 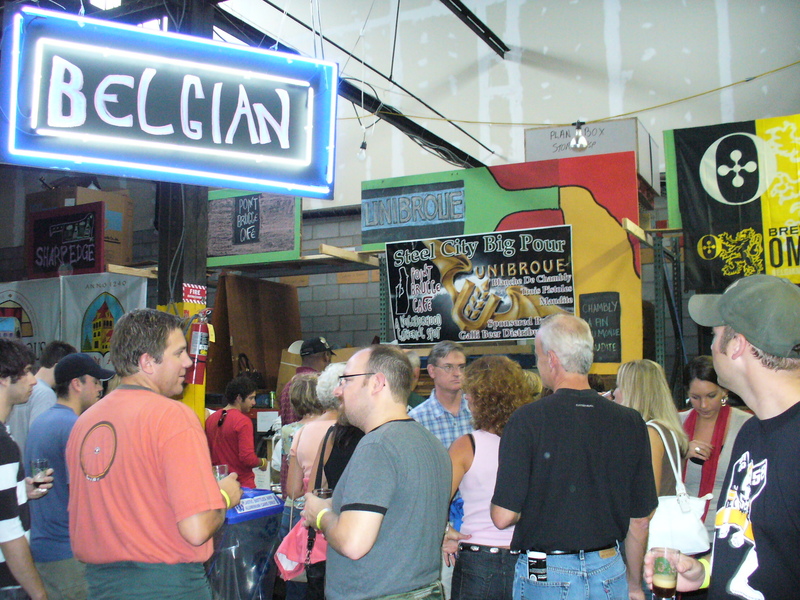 The beer was 30 micro and craft brewers from all over (but mostly from Pennsylvania or bordering states). For the $35 price of admission you got a taster glass to take around to all the different brewers' tables for samples. Each brewer had 3 or more selections on tap, so you do the math… But seriously, it was impossible to try them all, but we made a pretty good stab at trying the ones we thought we'd like! Brewery Ommegang, Cooperstown NY: I had the Three Philosophers (Quad) which I remembered liking from last year (and not surprisingly, did again). Al had their Dubbel, also good. Church Brew Works, Pittsburgh (Lawrenceville): Al liked the Coconut Stout – I thought it was OK, but I couldn't drink a whole bottle of it. The Oktoberfest was just OK.
Eel River Brewing, an organic brewer from Fortuna CA: I tried their Pale Ale, which was pretty good. Erie Brewing Co., Erie PA: I tried the Drake's Crude oatmeal stout, very very dark (black really) and tasty – I would call it a little smoky, which I liked. Hoppin' Frog Brewery, Akron OH: I enjoyed the "BORIS the Crusher" Oatmeal-Imperial Stout, which was had an aged taste. Al tried the Silk Porter, which they were pouring through a cylinder of coffee beans – very coffee-y, I liked it a lot that way. Marzoni's Brick Oven & Brewing Co,, Pittsburgh (Allison Park): Al tried the Chocolate Wheat, very tasty. Peak Organic Brewing Co., Portland ME: I tried the Maple Oat ale, which I liked a lot, but Al didn't much. 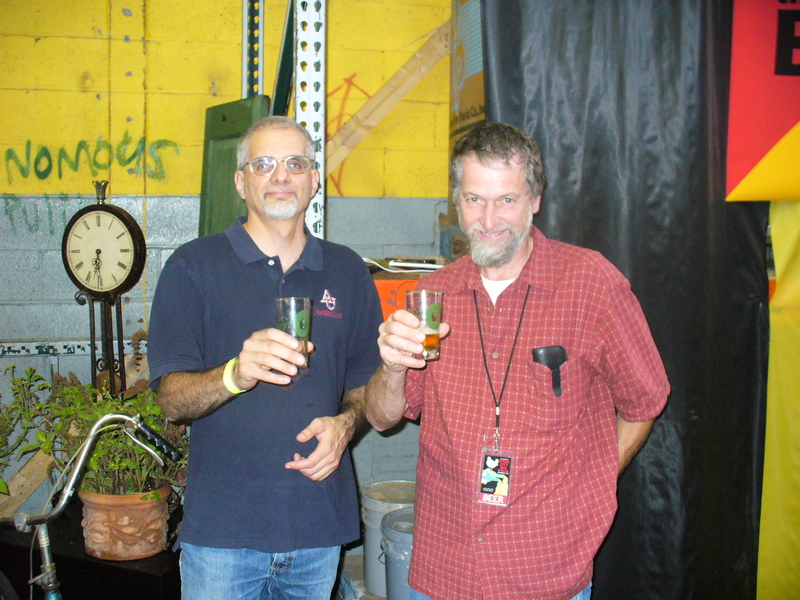 Sprague Farm & Brew Works, Venango PA: we both tried the Hellbender Porter, which was very chocolatey. Unibroue, Chambly Quebec: Al really liked their Tripel, La Fin du Monde. The pourer said he was the only one so far who knew what that meant! Victory Brewing Co., Downingtown PA: I liked their Festbier, nice and spicy. Al liked Baltic Thunder, which we thought was similar to Samichlaus. Wolaver's Organic Ales, Middlebury VT: I tried the IPA, and Al tried the Brown Ale, both sort of "eh". TRASH (Three Rivers Alliance of Serious Homebrewers), Pittsburgh of course: Again this year, our favorite was one of the many homebrews brought in by members of this club. Last year our favorite of the Big Pour was the espresso stout at the TRASH table, which Al was then able to replicate pretty successfully (and the 3rd batch of which is in our beer fridge as we speak). I tried the Red Rye, which was OK, but this year our hands-down favorite was the Bourbon Barrel Belgian Dark, aged in a bourbon barrel, just as it sounds. MMMMMM, so smooooth. Al's going to try it by using bourbon-soaked oak chips, similar to what he does with some of the wines. 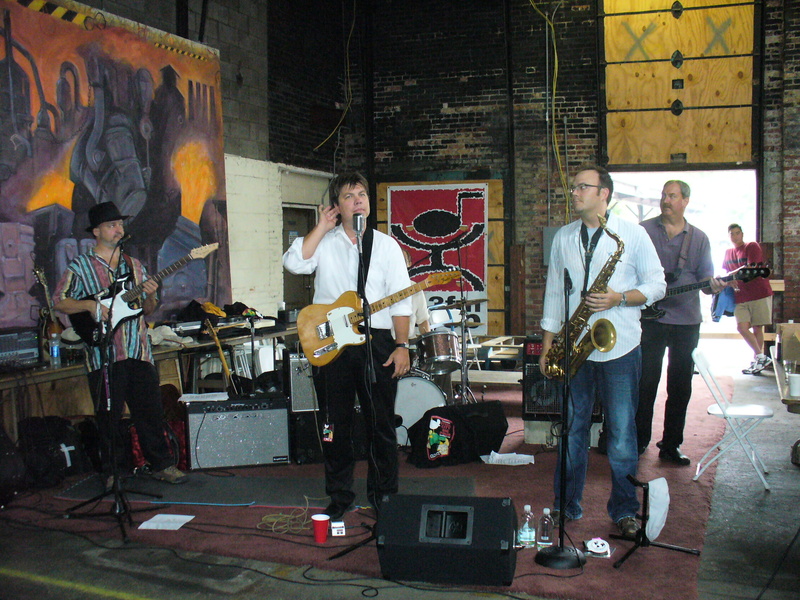 The music was by Hoodoo Drugstore, a local blues-y band. And then there was food included on the ticket as well, since you clearly can't drink all that beer on an empty stomach! 22 local "Food Partners" donated munchies to the cause. We had: she-crab soup and hot sausage meatballs from Bocktown Beer & Grill in Fayette; veggie wraps from Artspace & Coffeehouse in Point Breeze; hummus-type dip & pita chips from Pino's Mediterranean Bistro in Point Breeze; but our favorite was whatever-it-was from Tana Ethiopian Cuisine in Shadyside (really spicy!). A highlight was getting to see our friend John again this year! Last year we were totally surprised to see him there helping pour, but this year we looked for him and found him pouring for Victory Brewing. When he got a break we shared a few drinks, which was lots of fun. So yeah, all that in three hours! Most excellent! Can't wait till next year! Wow! Thanks for including all those links. Great post! Great post, wish I would've been there. I'm surprised Great Lakes wasn't there. If you like craftbrews, you should definitely try to get a ticket next year.